HoRNet Tape is a software simulation of the effect that magnetic tape apply to the signal recorded on it. Tape was the recording medium of choice before digital took its place in the early 90s and has s distinct effect that helped to define the sound of the music of the 60s, 70s, and 80s. What Tape does is to apply the distinct saturation of tape to your tracks and also adds the specific frequency response of four different popular tape machines, each at two different speed, 15 or 30 inch per second. Tape saturation acts differently on high and low frequency, saturating much faster at high frequencies and giving drums and vocals that peculiar “shhh” sound, low frequencies are made thicker and gain weight, this combined with the non-linear frequency response of tape decks creates the classic vintage sound. HoRNet Tape allows you also to change the bias applied to the tape changing the saturation characteristics and allowing you to increase the effect. The tape deck emulation includes both the typical frequency response given by the playback head and the internal electronics saturation, the frequency response alteration affects mainly the low part of the spectrum and is shifted up increasing the tape speed from 15 IPS to 30 IPS. We gave Tape the ability to automatically set its input gain thanks to our Auto Gain technology and help you target your “recording level” more easily allowing you to choose between +1, +2 or +3 VU, constant level monitoring is provided by the output compensation feature that will let you judge the effect without being fooled by loudness changes. Since a plugin like this that is meant to go on every track is only useful if you can judge it’s effect on the complete mix we have added a grouping feature that will let you automatically copy some of the settings (like the deck type, the target input level, bypass, etc.) to every instance of the plugin set to the same group. Up to 8 groups are available. The demo is fully functional except for the fact that every now and then it will silence out, you cannot save parameter values with your session and the plugin will not respond to automation coming from the host. Emulation of four different decks. Two different tape speed for each deck. Output compensation for constant level monitoring. Auto Gain with three different target levels. Group function to copy settings from instances. Mac OS X (>=10.7 Intel only) and Windows support. 64-bit compatibility both on Mac and Windows. Audio Units VST2.4, VST3 and AAX format. So simply download the plugin and enjoy your recordings! 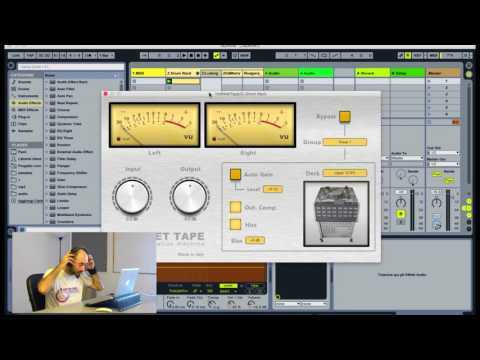 very great tape plugin!!! I own alot of high end tape emulators but none are as easy to get the sound I want as I can with Hornet Tape!! Now my tracks has more depth, warmth, more presence and realism!! Using Hornet Tape since its release. Compared to several other Tape emulation plugins, this feels very natural, easy to dial in and musical. Fantastic! Adquirir hoje estou impressionado com a qualidade, vale muito apena. Thanks this tape plugin is awesome I use it alongside the other tape emulations available in the market and yours is great. The more I use it the more I like ! Very nice plugin ! The best tape simulator out there! Hornet Tape has replaced my other "wavy" tape machine on my drum bus for good! It sounds much better with more warmth and clarity and it takes up significant less cpu! Great emulation! The ideal tape emulation for me. I have tried the demos of several others. I liked HoRNet Tape instantly when I first tried it. Still, I thought maybe it had too few parameters and I purchased a far more expensive alternative from another developer, thinking that having more choices would be better. After a year, I came back and purchaced Tape, and I use it instead of the more expensive & more complex alternative. It turns out that Tape has all the essential options, to get me the result I want much faster. Instead of tweaking and fine tuning lots of parameters, I go to Tape, choose the deck I want, make a combination of input gain & bias and I'm there in seconds. It took me a while to appreciate its simplicity, but it turns out that less is more in this case and I am happy I got the right tool for me in the end. Also I can't believe how little CPU it needs! It makes the recordings come alive and brings warmth to your tracks. Use it wise.